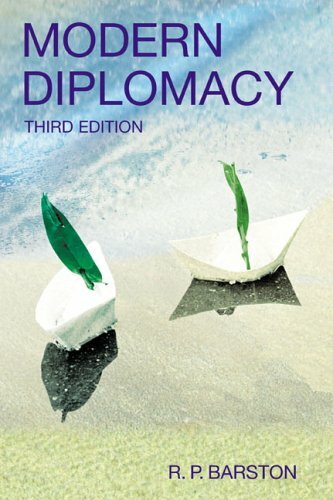 topic areas of contemporary diplomacy.New to this edition:The third edition has been extensively revised to include:nbsp; An additional chapter on diplomatic methods to reflect substantial developments in this area. Inclusion of a new chapter to explore the development of diplomatic practice. Examination of the international aspects of diplomacy of recent major disasters and emergencies. Exploration of the influence of international terrorism and violence upon the international system of diplomacy. nbsp;Professor R P Barston teaches international relations at the Graduate Institute University of Reading . He previously taught at the Universityof Lancaster, Keele andnbsp; London School of Economics . He is a former member of the United Kingdom Foreign and Commonwealth Office and has extensive diplomatic experience . He has undertaken diplomatic and regional organisation training in a number of countries including Malaysia(National Institute of Public Administration) , Trinidad, Vietnamand Barbados. nbsp;He is also a maritime safety specialist and representative to the International Maritime Organisation. His other publications includenbsp; Maritime Dimension , The Other Powers and International Politics Since 1945 .